When you think about getting Waders for fishing, the best choice in terms of material is usually one that is breathable. 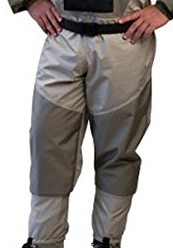 Caddis Men’s Deluxe Breathable Stocking Foot Waders promise to be so: while letting no water in, the small water molecules can still exit easily, a permeable membrane makes it possible. In theory, you should sweat less, since it prevents the building of moisture inside. Especially in the summer month or in warmer areas, this is a huge advantage. This is the review about the Deluxe version of the standard Caddis breathable Chest waders. Let’s see if the deluxe-upgrade to the standard version is worth the extra money. On first sight, the material seems a little thinner than expected, even for polyester. They are a bit tighter around the calf area and therefore I wouldn’t recommend wearing them over heavier pants. The fabric feels durable enough for the average fishing trips and the included reinforced knees, make sure that kneeling on stones can be done without a bad conscience. This is one of the features the normal version does not include. All the important seams are taped, stitched and glued, sound good but Is pretty much standard in the industry. With all that said, don’t expect them to be as durable as neoprene waders. Although the manufacturer promises “heavy-duty polyester”, it is still only polyester and therefore not made for robbing through forests or similar. If you look for duck hunting waders you should read my review about the Frogg Toggs Amphibs. The insulation works well, I took them out for a 5-hour fishing session, standing in my local stream and while it can be pretty chilly with thin breathables, it felt like the perfect temperature in this pair. I was wearing thin under wader pants and thermals underneath. The fitting is exactly what you want, the crotch is where it is supposed to be, therefore you do not have the baggy look, which you see a lot, looking at cheaper waders. The material used here brings decent flexibility with it, and the cut of these waders lets you sit comfortable, which is definitely not always the case with these type of clothes. Since we are talking about stockingfoot waders, you have to purchase wading shoes separately. Not a bad thing, the waders are lighter and easier to transport that way. Combined with a pair of lightweight and comfortable shoes they could be a good choice for travel and even longer walks to fishing spots should not be a problem. Cleaning stockingfoot waders is also pretty easy, just put them in the washing machine on gentle cycle. The deluxe version has the same problem as the standard version: The neoprene boots are a little oversized, therefore you might want to order a smaller size, or just wear an extra pair of comfortable socks. Do not forget that your wading shoes still have to fit! The Caddis come with a included wading belt, which you should always wear while standing in the water. What I miss here though, are some belt loops, so make sure to adjust the belt tight to prevent it from sliding off. In my opinion a “deluxe” version should have this. I found the front pocket to be handy, having enough room to store a small box of flies or something similar. An extra feature is the included hand warmer pocket for colder days. When combined with a traditional hand warmer in addition, they should certainly do the trick. Included gravel guards protect from gravel and other debris that try to work its way into your wader boots. They work as intended which saves you another ten dollars since you do not have to buy them separately. It is worth mentioning that, at least when you buy them from Amazon, they have really friendly customer support. I had some minor problems with the zipper of the front pocket and they immediately offered me a new pair as soon as I sent back the old one. Reinforced knees are definitely a plus, preventing holes while kneeling on stones or similar. I would recommend the deluxe version over the normal one, for people that look for that little bit of extra toughness, which can make a difference. 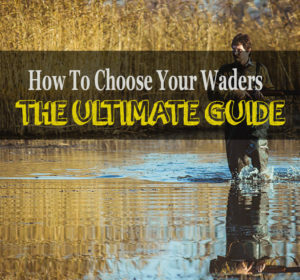 If breathable material is important for you and you do not want to spend several hundred dollars for a pair of waders the Caddis are a decent choice. The important parts, especially seams, are done properly and make sure that they outlast many other products in this price range.